Heat oven to 350°F (for all pans). Spray 60 mini muffin cups with cooking spray. Make cake batter as directed on box. Divide batter among 4 small bowls, about 1 cup each. Make 4 different colors of batter by adding 1/4 teaspoon food color to each bowl; blend well. 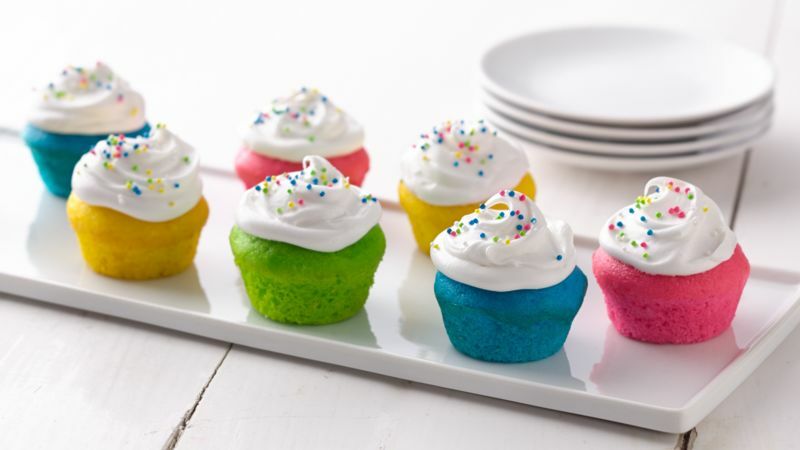 Fill each muffin cup with 1 level measuring tablespoon batter, making 15 cupcakes of each color. Bake 11 to 14 minutes or until toothpick inserted in center of cupcake comes out clean. Cool 5 minutes; remove from pan. Cool completely, about 10 minutes. Top with frosting, and decorate with nonpareils. Store loosely covered.